Actor. Writer. Whatever. : (essays on My Rise to the Top of the Bottom of the Entertainment Industry) (Paperback) | The Drama Book Shop, Inc.
An honest, inspiring exploration of the New York acting world, ambition, and success, delivered by a fresh, bold insider's voice. In her critically acclaimed essay collection, writer Mellini Kantayya exposes the pinnacles and pitfalls of pursuing artistic ambitions and life as a rank-and-file actor. Her unflinching depiction of show business, backstage anecdotes, and self-deprecating humor will resonate with both the creative and the curious-and inspire anyone who has ever juggled making art and making rent. Mellini Kantayya is the critically acclaimed author of Actor. Writer. Whatever. 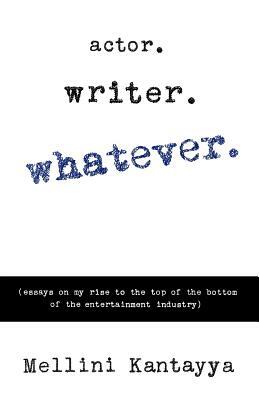 (essays on my rise to the top of the bottom of the entertainment industry). She is a writer, actor, culture critic, and humorist. Her work has been seen in Okayplayer and regularly in The Huffington Post. She has been a commentator on NPR affiliates and lectures at colleges. Her most recent acting credits include Nurse Jackie, Breathe In, and Alpha House. Mellini has been a storyteller at the Mark Twain House and various venues in New York City. She has written screenplays, developed an education children's TV show, founded a film festival, directed plays and short films, and has even been a back-up dancer in a few hip hop videos (though she'll never tell you which ones). She lives in Brooklyn, NY.